The editor who oversaw a pro-Scottish independence daily’s launch and a circulation boost after its Sunday sister title backed the campaign is to leave his role. Richard Walker, left, who edits both the Sunday Herald and The National, is to take voluntary redundancy along with Tony Carlin, editor of the Glasgow Evening Times. Up to 20 jobs were placed at risk last month when publisher Newsquest opened up the VR programme to staff across its Glasgow-based Herald & Times group. The decision by Richard and Tony to take redundancy has sent “shockwaves” through the Evening Times and Sunday Herald newsrooms according to a tweet by the National Union of Journalists. Although stepping down from his full-time roles, Richard, who was given the editor of the year accolade at Newsquest’s annual Excellence Awards in February, is to take up a new position as consultant editor of The National. He was the Glasgow-based newspaper’s founding editor when it launched in November 2014, following the referendum in Scotland that September. Richard also oversaw the decision by the Sunday Herald to come out in favour of independence in May last year, which led to the paper’s circulation more than doubling in the months leading up to the referendum. As a result the Sunday Herald became the only daily or Sunday title in the UK to increase its circulation during 2014. 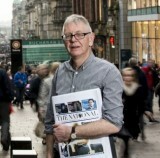 Richard first joined the Sunday Herald as production editor when it launched in 1999 and was appointed editor in 2004. He began his career on local newspapers in Ayrshire, and has also worked on the Evening Times, Scotland on Sunday, The Scotsman and Daily Record. Tony, pictured left, has been in charge of the Evening Times since December 2009, and had previously served as group content editor at the Newsquest-owned Herald & Times Group. 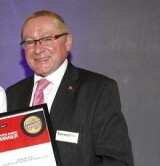 From July 2006 to January 2009 he was the deputy editor of the Evening Times. Announcing Richard and Tony’s decision, Herald & Times Group managing editor Tim Blott said: “I have worked with them for a number of years. They have been great ambassadors for the company and strong champions for their titles. The resignations follow a reported 26% hike in profits – most of which was generated through previous staff cuts. So dies a once fine newspaper group. Check out Dyson at Large for further tales of Newsquest inflicted woe at the Reading Chronicle.